This is the Post all my athletes need to read. For the athlete dealing with a painful situation, coming to a useful understanding of what is good and bad pain becomes crucial to speedy rehabilitation. Good pain is discomfort that is appropriate to work out through, or to feel afterwards. Bad pain is discomfort that must be stopped, the breeding ground for setbacks and flare-ups. Varying pain thresholds in athletes can greatly complicate matters. Some athletes with a high pain threshold can train through a more serious injury believing that they are doing no harm, only to find that the injury has greatly worsened. 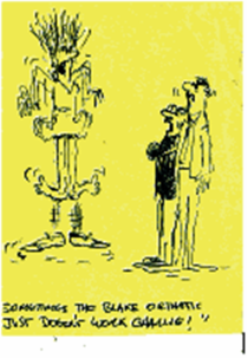 In this case, their body’s own feedback mechanisms have let them down. Something in their head is yelling “No Pain, No Gain,” in probably several languages. They can participate at very high levels with pain, hoping that they can work through it. Sometimes they can, but many times they can not and the injury gets worse. Most of these athletes need the outside help of coaches and personal trainers, doctors and physical therapists, to help set some limits. Their own “self-preservation” mechanism is not working properly. Evolution to better body awareness can occur with good coaching. There is hope for this group. For other athletes, including myself, with low pain thresholds, all pain is bad and can not be tolerated. This group may actually learn to accept some pain as okay, or good pain. They can also evolve. Besides varying pain thresholds, there are many physiological reasons that the exact same injury can hurt a lot more for one athlete than another. The closer an injury is to a nerve, the more it hurts. The more your body swells with any injury, the more you hurt. If the injury is on the outside of your foot, and you walk/run on the outside of your foot, you will hurt more than another patient who walks/runs on the inside or the middle of their foot. The weaker the area is before you are injured, the more you will hurt after the injury since it will take longer to get the area strong. These factors are just a few. Remember, injuries first heal and then double heal. Some bones like your metatarsals may get approximately twice as thick during the total healing process. This is why tendon and ligament injuries can heal with scar tissue that leaves the tissue twice as thick. So, even when an injury is completely healed, more healing may occur for several more months possibly producing noticeable symptoms to the athlete. Healing always produces some level of pain with swelling, muscle tightness for protection, scar tissue breakdown, etc. This can be good pain. So, how do we make some sense with this? 4 Golden Foot Rules may give us some focus. • Golden Rule of Foot: Never push through pain that is sharp and produces limping. • Golden Rule of Foot: Never mask pain with pre-activity drugs, including ibuprofen, aspirin, etc. • Golden Rule of Foot: 80% of healing occurs in 20% of the overall time, with the remaining 20% taking 80% of the total time. • Golden Rule of Foot: Good pain normally dwells in the 0 to 3 pain level (scale 0 to 10). Let us focus on these 4 rules. When an athlete asks if they can participate in their activity, there is no breaking of the rule of sharp pain and limping. Good pain may be at the start of a workout, then eases up. If the pain comes back in the middle of a workout, this is bad pain and it is best to stop. Participating with a team activity that is semi-dependent on you is tough as you ease yourself back into activity. But you must be clear from the start of the activity that you may need to stop if pain develops. Ask your co-participants to tell you if you are limping. Sometimes they see it before you feel it. Limping throws the entire body off, risking other injuries. Sharp pain normally produces limping, but limping can also occur as you transfer weight to avoid pain or if a body part is too stiff to bend properly. Drugs, as simple as aspirin, ibuprofen, etc, can mask little to significant pain. Never take these drugs before participation, only after if allowed. In general, 6 hours before an event is permitted. Many of the anti-inflammatory drugs also inhibit bone healing, so are contra-indicated in bone injuries entirely. Healing can take a long time to completely occur with any injury. The job of the doctor, therapist, and patient is to try not to repeatedly get in the way of the healing process. But even with our best efforts, we tend to take two steps forward, one back, then two forward, then three back, and so on. I am happy to say in following injuries for more years than most of my readers have existed on this earth, injuries do heal. People do forget what ankle they sprained in 2004, and what heel got plantar fasciitis in 2007. Yet, most healing occurs in 20% of the time, with the remaining 10-20% healing occurring in 80% of the time. When you are 80% better, level 1 or 2 pain still may exist, but you can do everything athletically your heart desires. But, it can take months and months of icing, stretching, strengthening, occasional flare-ups, to get rid of the last 20% of symptoms. It is considered the realm of good pain, but it can wear thin on our nerves and patience. Good pain is pain/discomfort/soreness/tenderness/dolor that does not have to interfere with activity. Listen to your body. Does the pain cause limping? Is the pain sharp in intensity? Does the pain come on in the middle of an activity? Does the pain come on after an activity and hurt then for several days? Does the pain come with increased swelling? These are all signs of bad pain. 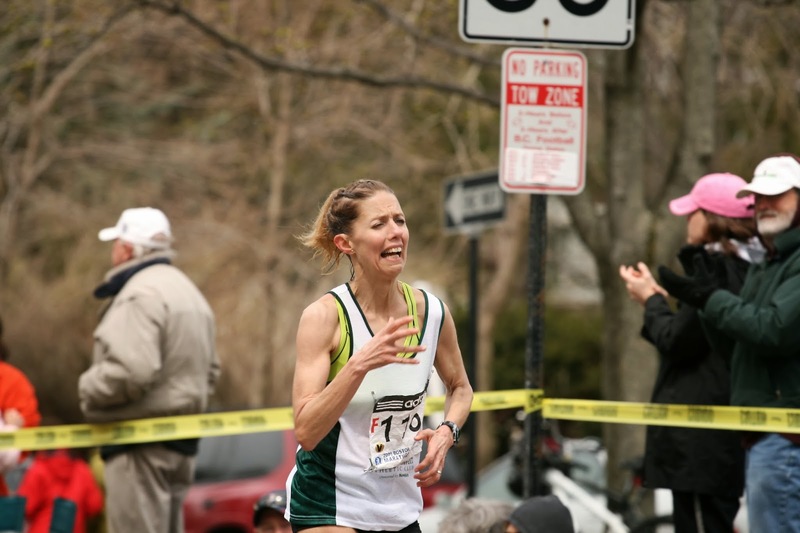 Good pain stays in the 0 to 3 range, no matter what your pain threshold is. Good pain is normally gone the next day, so there are no residuals. Good pain does not cause limping, and is not sharp. Good pain, is not perfect, but your daily reminder to keep icing, stretching, strengthening, and listening to your body. Good pain can be a good guide to allow you to work an injury to complete healing. But, you may ask, why not just wait until you have no pain before you go back to activity? The more inactivity, the more deconditioned you become, and the longer the return to activity process will actually take. So, it is better to try to discover the difference between good and bad pain. The better you become, the better decisions you will make in your athletic life, and the longer you will be an athlete. The better you become, the better prepared you will be for the next injury. An important medical decision may be made based on your knowledge of good and bad pain. If all pain is bad, you will have a less active life and may seek surgical intervention as a quick fix. 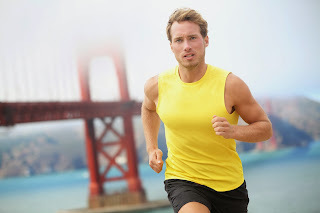 If you still believe "No Pain, No Gain", I can not wait to see you at our sports medicine clinic as a regular customer. Learn about your body through this process. It has prevented 3 surgeries for me. And the same rules can apply to anyone recovering from any type of injury, not just athletics. Good Luck!! My name is Susan (name changed) I'm 33yrs old and suffer from piriformis syndrome. I was given your name by Dr Stephen Pribut, top sports podiatrist in Washington, DC. I have been injured for over 2 1/2 years now (in April it will be 3). I am in constant pain. I got injured as I was working as a nurses aid in a retirement home and I was helping a resident use the restroom. Well as he was standing there his knees gave out and he dropped and I jerked forward and twisted right. I immediately felt excruciating pain in my low back into my behind. Well about 8 months after I got hurt they finally did a second MRI and discovered my piriformis syndrome. 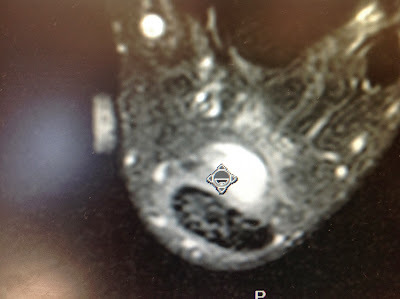 Dr Blake's comment: You will be able to see from the videos below what they saw in that MRI. What Dr Filler, neuro-surgeon, will say is that 25% of low back surgeries fail since they are actually piriformis syndrome in disguise. I've tried everything from PT, pool, ice, heat, injections, chiropractic and finally surgery. Well my muscle is still tight and I still have immense pain and feel like I'm sitting on a rock. Dr Blake's comment: The importance of one of the below videos is that a percentage of piriformis syndrome patients have injured their SI joint (Sacro-Iliac) and the piriformis is in spasm to protect that joint. This could have easily happened in Susan's injury. Anyways I'm from Longview, Washington. Do you know anyone around here that specializes in this! My Dr is an Ortho surgeon and he has only done this maybe 4-5 times in his whole career! I'm desperate to have my life back! I'm even willing to travel I just need help! Susan's Response: Thank you! I'm interested that you say it's common because I have been told it is an uncommon issue and most of the drs around here won't even take me as a patient because they don't know how to treat it and some have even said they've really never heard of it before! Lol so I hope dr reeves can take on my case and give me some relief! I need it! This pain is excruciating (hence the reason I've been awake since 3 and emailing you back so early!!) I'm just so ready for relief! And to be active again!! I appreciate your help and will definitely keep you updated! Dr Blake's comment: Perhaps a call to Dr Filler's Santa Monica office to see if they know someone in the Seattle area. All my Piriformis/SI joint issues see Dr Irene Minkowsky in San Francisco, so I am spoiled. She is a physiatrist specializing in that area. I would definitely have a non-surgeon tell you that you need more surgery. The videos below speak of some elements of rehabilitation, but as of now, there has to be a reason for your pain, and a common cure. Thank you. I talked to dr reeves and he referred me to a dr chun. I had another MRI done on Monday. And will get my results the 31st (10 days from now). You can share my story or whatever you would like to do. I was stuck in bed all week because of my pain. They taped my feet together so my hips would be in a certain way for the MRI and it was excruciating!! I couldn't walk by myself after that. I had one person on each side of me helping me. I just want to have my life back!! I can't do my normal life for the last 2 1/2 years! It would be nice to be active again! Anyways I'm trying to get into see dr chun I just need my referral and approval through labor and industries. :) I appreciate your help! Dr Blake's comment: So, I have a variety of very good videos below talking about so much of the syndrome. For Susan, Rehabilitation can not even start until we create a pain free environment. I am hopeful that Dr Chun can begin that process. The first stage of Injury Rehabilitation is Immobilization and Anti-Inflammatory. Susan is trying her best to Immobilize, but something is hindering her recovery. Since the piriformis is an external hip rotator in gait normally, which helps support the arch (preventing internal tibial and talar motion with pronation), as a podiatrist I will use a lot of highly corrected Inverted Orthotics to help this condition. If the problem lies in a jammed SI joint, the same orthotic can make the patient temporarily worse. Thus, the art of medicine. This is a good place to start a discussion on Sciatica and Piriformis Syndrome. Here are a few good videos discussing anatomy, diagnosis, and some elements of treatment. I was diagnosed with pre-dislocation syndrome in my right foot 9 months ago. Dr Blake's comment: This normally refers to the 2nd metatarsal phalangeal joint where the toe begins to develop a hammertoe and begins to dislocate off its normal position on the metatarsal. 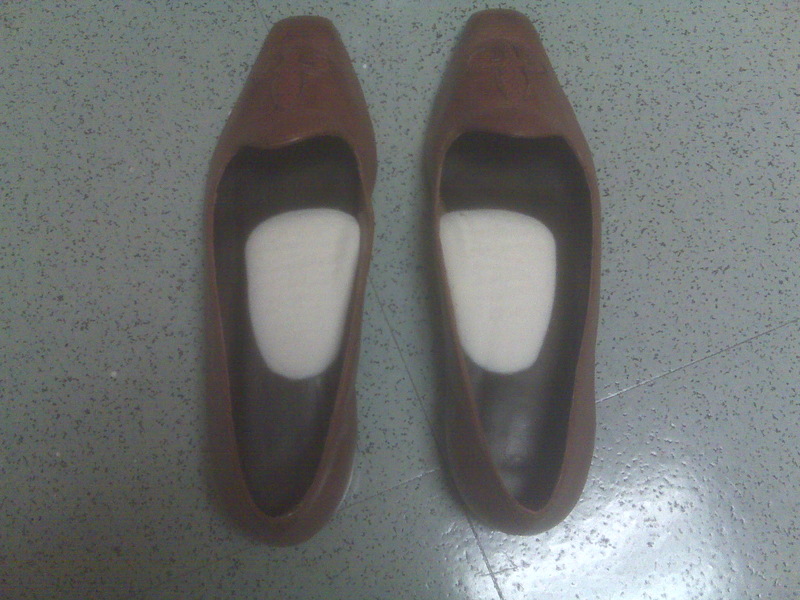 I limited my activity, wore a flat post-op shoe for 3 weeks, and got custom orthotics. Not only did the pain not get better, I developed sesamoidits in both feet, but worse in the right. Dr Blake's comment: Pre dislocation syndrome of the 2nd MPJ is treated with metatarsal pads ( higher the better), budin splints when needed to control toe position or pain or both, icing 2 times per day, and metatarsal doming/arcing exercises. Orthotics are only for long term stabilization, not when the acute symptoms begin. If you have pain in the 2nd joint, every orthotic made will try to put weight on the first and off of the second. This weight transfer could be the reason for the sesamoid pain under the first metatarsal head (ball of the foot). Got orthotics adjusted. Started icing and NSAIDS every day. Right foot swelled up massive and was so tender I couldn't bear to have heavy covers over my feet at night or to put any pressure on the right foot. Dr Blake's comment: So, your initial injury now becomes a secondary war zone that must be calmed down. This acute phase must be turned into a subacute or chronic state with Immobilization. Okay, so then we tried 3 weeks on crutches (got marginally better, but still swollen and painful), 1 cortisone shot, 8 weeks with tall camwalker and a donut pad around sesamoid. The latter resulted in 1 good day, 2 agonizing days, 1 good day, 3 agonizing days, 2 good days, 1 agonizing day, etc. Still massively swollen and painful much of the time. Dr Blake's comment: When the primary injury has such an acute phase, with swelling out of control, you must begin treatment of nerve hypersensitivity. A pain management specialist should be called into to help. The initial protocol is like the treatment for Complex Regional Pain Syndrome even if you have not been labelled as such. Also, non weight bearing on crutches typically does not get rid of swelling, since it is weight bearing that is needed to move the fluid out of the area. X-rays do not suggest that it is fractured--just high arches. I'm not running or hiking or anything else I used to do on a daily basis. I can barely walk to the restroom without pain hence barely moving. The next step might be a plaster cast all the way past my toes for a month or more. I have a pretty demanding job and I'm not sure how I could do this and keep my job--they've already put up with a lot--so I am hesitant unless it is absolutely necessary. Dr Blake's comment: In this scenario, immobilization in any form should be avoided. Even non-weight bearing on crutches makes the swelling worse, since weight bearing removes swelling if it can be done with little to no pain in a protected fashion. Any advice on the whole idea of complete immobilization? Could orthotics for the pre-dislocation syndrome have made me get sesamoiditis? I'm obviously now afraid of any more treatments since everything seems to have made it worse, although maybe that was just going to happen on its own, not sure. Dr Blake's comment: Thank you again for emailing and I am sorry for your problem. These are the things I think you should be doing, but your doctors have the last say since they can see you. Immediately begin to see a pain management specialist to help control the pain symptoms, and pervent this going forward towards CRPS. Use the crutches with the cam walker and sesamoid pads to allow as much healthy weight bearing as tolerated. Purchase some OTC Neuro-Eze online and massage into the tissues 3 times per day. See if your body can tolerate contrast bathing twice daily with the ratio of 1 hot to 1 cold water. If the orthotics do not take enough pressure off the sesamoid, go back to have them redone for you will need this soon to help wean off of the boot. See if you can find a flat hiking shoe (even if it is 1 size larger) that is stiff and limits the pain in the sesamoid area. Ask your PCP for an Rx now of Lidoderm Patches. See my blog post on the CRPS checklist to look at all the areas to explore to get this under control. Good luck!!! Thank you for this wonderful blog! I have been dealing with an injured (and re-injured) left MTP joint for years now. It recently felt bad enough that I sought out my GP. X-rays showed mild-moderate 1st MTP joint degenerative disease with joint space narrowing, subchondral sclerosis & cystic changes and osteophyte formation. I tried googling all this, but would love it if you could explain these in lay person terms. Dr Blake's comment: You have arthritis in your big toe joint which is causing pain. Below are some links to Hallux Limitus/Rigidus which are degrees of restricted range of motion that develop as the arthritis worsens. I have a little range of motion loss compared to the other side, but I still think it's around 60 degrees. Am I on the road to hallux limitus? Dr Blake's comment: Yes, and you need to daily do the self mobilization technique in my video below. Also, if you pronate, get orthotics for your most strenuous activities. Place dancer's pads in any shoes you can. My main complaints are the pain and swelling that occur after walking around with shoes with 1" or 1-1/2" heels as well as after tap dancing. I am currently not tapping, but would love to return to it, but am worried about irritating the joint. Lastly, I see you mentioning dancer's pads often. Do you have instructions on how to craft one? I appreciate any advice and help! 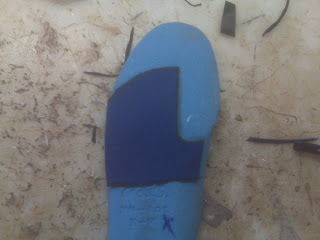 Here a dancer's pad to float the first metatarsal head is made of Spenco material and glued to the bottom of the shoe insole. 1/8th inch to 1/4th is normal, but you should never feel like you are falling into the hole created. 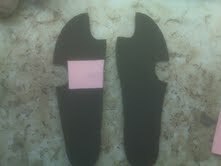 Here the 1/8th inch adhesive felt from www.mooremedical.com is being used to change weight bearing off of the 5th metatarsal. Dr Blake's comment: You should do just fine with tap dancing with icing twice daily to reduce the inflammation, dancer's padding with 1/8th inch adhesive felt from www.mooremedical.com, use of Hapad Longitudinal Medial Arch Pads for the shoes from www.hapad.com. You may also need to learn to spica tape. Here Small Longitudinal Medial Arch Pads from the Hapad company are used as an arch support to transfer weight from the big toe joint into the arch and also into the 2nd and 3rd metatarsals and off the big toe joint. Because it is an adhesive felt, it can be moved around and thinned by peeling when needed.